309km Audax UK cycling event starting from Cutty Sark Gardens, Greenwich at 6am, Saturday 29th September 2018. Controls at Edenbridge, Seaford, Crowborough, Bexhill and Tunbridge Wells, plus 4 information controls (Ebbsfleet, Forest Row, Laughton, Ide Hill). 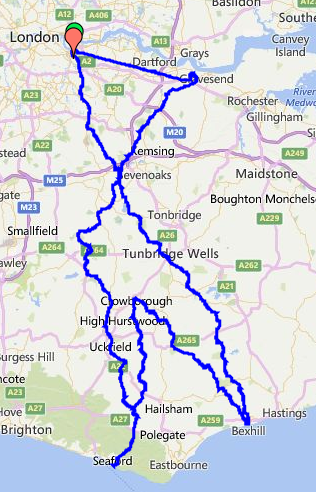 A challenging ride out of South London and through the quiet lanes of the Downs and Weald. Featuring not one but two trips to the seas and around 4500m of climbing. Counts towards the Grimpeurs du Sud award as well as the Audax Altitude Award. Includes light refreshments at the start and food at the ACH Seaford control (rather than Edenbridge as in previous years) – all others require a visit to a shop/café/garage/cashpoint for a receipt. Full meal and beer at the finish for a traditional Audax Club Hackney Arrivée welcome at the home of the organiser, all for the princely sum of £14. Routesheet and GPX files will be available after a final routecheck during September and emailed to all entrants. A great write up of the inaugural event in 2015.